RENO, Nev., Feb. 11, 2019 (GLOBE NEWSWIRE) -- NuLegacy Gold Corporation provides a review of its 2018 exploration program, including the results of the widely spaced exploration holes of its fall/winter drilling program on the company’s 100% owned, 108 sq. km Red Hill property located in the Cortez gold trend of north central Nevada. Executive Summary: We are fortunate to have the Northern Nevada Rift transverse the western portion of the Red Hill property; this is both a great opportunity and has been a challenge. The opportunity is that the Miocene age basalt flows of the Rift host significant epithermal gold-silver deposits throughout northern Nevada in proximity to our Red Hill property (see accompanying map). The VIO zone on the western extreme of the Red Hill property is one such opportunity. The challenge is that this Miocene volcanism also covers and masks portions of the much larger Eocene age Carlin-type deposits targets that we have been exploring for and discovering. The highly prospective Rift Anticline ‘Carlin-type’ target, as discussed below, is one of three such opportunities discovered as a result of this fall-winter’s drilling program. “This is an example of how our aggressive step-out drilling has expanded our understanding of the Red Hill’s geology and opened additional opportunities”, comments NuLegacy Chairman Albert Matter1. 2018 Drilling: The highlight of the 2018 drill program was core hole SR18-02C, which returned 8.7 meters of 16.9 grams/tonne gold as it extended the Serna zone a full 100-meters (330 ft) to the west. The analogue for these Red Hill zones is Barrick’s ten million-ounce Goldrush deposit situated 9 km to the north-west2. It’s a lengthy 5 km “ribbon-like strand of gold mineralization” (250-meter-wide and 75-100 meters at its thickest), grading an average of 10+ grams of gold/tonne. While subsequent drilling north and south of SR18-02C returned only anomalous gold values, NuLegacy’s exploration-team has since interpreted that higher grade gold mineralization should lie west and southwest of SR18-02C, as illustrated in pale orange on the above map of the Serena-North Iceberg; the untested ground west of the Serena zone will be a focus for exploration drilling in early 2019. Fall 2018 Drilling Results: NuLegacy completed its fall 2018/winter 2019 drilling program on January 15, 2019 with several widely spaced outlier holes. While numerous anomalous intercepts were encountered, the most important result was from exploratory hole, WS18-01, drilled 1,200 meters (3,900 ft.) west of the Serena zone along the Long Fault corridor, on the Rift Anticline target. WS18-01 returned an interval of 3.1 meters of 0.39 grams/ton gold within a fault zone within the Wenban formation. More importantly, upon careful re-interpretation of the geophysics (literally ‘looking through the cracks in the basalts’), WS18-01 evidences that the structural components critical to hosting a major part of the Red Hill’s Carlin-style gold systems has been hidden under the post-mineralization basalt flows well to the west of the Serena-Iceberg complex. 2018 Relogging for Transformation: When Charles Weakly, (NuLegacy Gold District Geologist and former Regional Geologist at Barrick Gold) joined NuLegacy in January of 2018, he initiated a complete revision of the interpretation of the Red Hill’s stratigraphic column based on the re-logging of all 223 of our previous drill holes (54,000 meters) as well as reinterpreting previously collected geochemical and geophysical data3. Charles remarks, “We now know that all the ingredients – the correct host stratigraphy, the correct alteration package, the correct high and low angle structural components – exist on our Red Hill property. The three new target areas (Rift Anticline, East VIO, and Western Slope) we identified under the basalt flows are exciting and have a good chance of leading us to the fire behind all the smoke [Iceberg & Serena zones] discovered to date”. NuLegacy’s 2019 Phase 1 drilling plans will focus on finding the ‘ribbon of gold mineralization’ within the 5 km strike of the Rift Anticline zone. In addition, the two step-out holes completed in Fall 2018 to the west of the Avocado drilling cluster, support an interpreted left-lateral offset of the Iceberg fault across east-north-east range-front faults, and the possibility of increasing strength of alteration and mineralization along the western Avocado corridor. Improved CSAMT interpretation also supports structural stacking of host stratigraphy within an apparent zone of strong alteration in the East Vio area. West VIO zone geophysics: In the summer of 2017, NuLegacy reported important epithermal gold-silver mineralization discovered on the western side of the Red Hill property in an area historically called VIO. That discovery in drill hole VIO17-01 reported 9.1m of 1.8 grams/ton gold and 17.6 grams/ton silver. To better understand the structural components of the mineralization and develop additional drill targets, a gradient array IP geophysical survey was conducted in 2018. The results show a series of four strong northerly oriented liniments interpreted to be high angle faults within Miocene age basalt from the Northern Nevada Rift. This is similar to the geological setting that hosts the Buckhorn, Mule Canyon, and Fire Creek epithermal mines to the North of Red Hill, which are the analogues that the NuLegacy exploration team are using for further exploration in this area. Exact drill locations are being defined for testing later in the 2019 season. Metallurgical Work: During fall 2018, pulp samples from Serena zone core hole SR18-01C (15.2 meters of 3.27 grams of gold/ton) were submitted to American Assay Labs in Reno, Nevada for one-hour cyanide leach analysis for comparison to fire assay values. The material from SR18-01C showed an average of 70.3% recovery of gold in the oxidized portion of the hole and 59.7% recovery in the unoxidized sections suggesting the mineralization would be amenable to heap-leaching and that the unoxidized ore could provide significant recoverable gold using standard heap leach methodology; we will begin analysis as to how this can be improved upon. Permitting: In November 2018, NuLegacy reported final approval from the U.S. Bureau of Land Management for the ‘Avocado’ Plan of Operations (PoO) environmental permit. The Avocado PoO represents a significant asset for the Company as the baseline studies completed (biological, hydrological, and archeological) will be essential for any future development of a gold deposit at Avocado. The PoO covers 2,579 acres (4.1 sq miles) and the larger disturbance allowance will give NuLegacy more flexibility in planning and permitting drill sites. NuLegacy intends to bond an initial 95 acres within the PoO to complete its anticipated 2019 exploration programs. Previous exploration of Avocado was conducted under a Notice of Intent (NOI) was limited to five acres of surface disturbance. NuLegacy’s planned Rift drilling west of the Serena and North zones will continue under its current “Foothills” NOI permit until the expansion of the Company’s original Central Mineralized Zone PoO is modified. Drilling at VIO will be conducted under the Vio NOI. 2019 Spring-Summer Phase 1 drilling plan: Contemplates an initial 8,700 meters (28,500 feet) in 20 holes at the Rift Anticline (4 holes), West Avocado (3 holes), East Avocado (1 hole), Serena extension (4 holes), East VIO extension (2 holes) and West Vio (6 holes). Conclusions: The Red Hill provides the potential for outstanding results for NuLegacy in 2019. Barrick’s adjacent Goldrush project is slated to begin production in 2021 at a rate of 500,000 ounces per year. While no NI 43-101 qualified resources have been calculated to date for the Red Hill, it has more similarities to Goldrush than any other project in the Cortez trend. NuLegacy remains confident that our persistence and determination will reap substantial rewards in 2019 and beyond. Corporate transactions: To husband cash for exploration, NuLegacy has arranged a private placement of 350,000 shares at C$0.15 per share with a lessor to cover a portion of the Company’s 2019 lease obligations. Similarly, the three Independent Directors have expressed their preference to receive their individual directors’ fees ($7,500 per quarter) in common shares of the Company. These shares will be issued to the directors on a quarterly basis at the market price of the Company’s shares at the time of issuance and are subject to a four month hold period, in accordance with the policies of the TSX Venture Exchange. Both transactions are subject to acceptance of the TSXV. Sampling Methodology, Chain of Custody, Quality Control and Quality Assurance: All sampling was conducted under the supervision of the Company’s project geologists and the chain of custody from the project to the sample preparation facility was continuously monitored. A blank or certified reference material was inserted approximately every 20th sample. The samples were delivered to American Assay Lab or ALS laboratories’ preparation facility in Nevada. The samples were crushed, pulverized and sample pulps were analyzed using industry standard fire assay methods. Data verification of the analytical results included a statistical analysis of the standards and blanks that must pass certain parameters for acceptance to ensure accurate and verifiable results. The reported intercepts are not necessarily true widths as there is insufficient data currently with respect to the shape of the mineralization to calculate its true orientation. 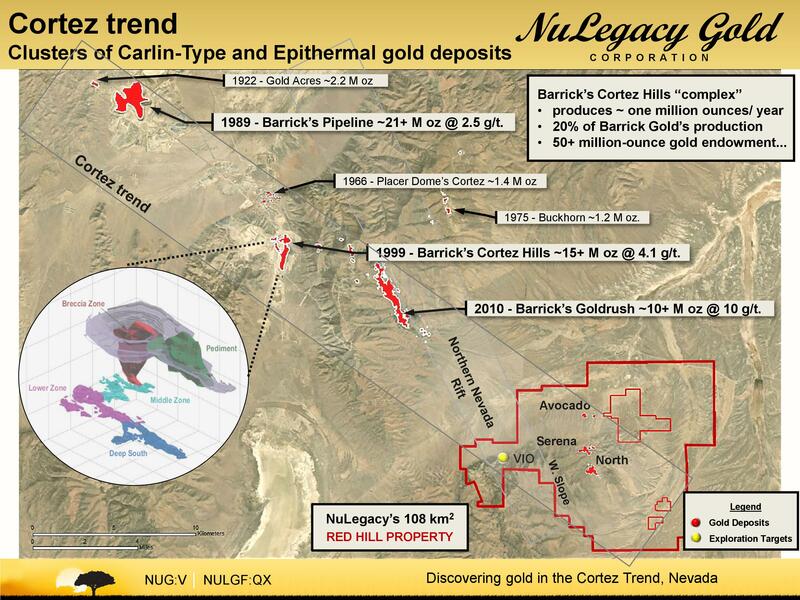 About NuLegacy Gold Corporation: NuLegacy is a Nevada exploration company focused on discovering additional Carlin-style gold deposits on its premier district scale 108 sq. km (42 sq. mile) Red Hill Property in the prolific Cortez gold trend of Nevada. NuLegacy’s Red Hill Property is located on trend and adjacenti to the three multi-million ounce Carlin-type gold deposits (the Pipeline, Cortez Hills and Goldrush deposits) that are amongst Barrick Gold’s largest, lowest cost and politically safest gold minesii. i The similarity and proximity of these deposits in the Cortez Trend is not necessarily indicative of the gold mineralization in NuLegacy’s Red Hill Property. For further information, please phone 604-639-3640 or contact James Anderson (CEO) at james@nuggold.com, Albert Matter (Chairman) at albert@nuggold.com or visit www.nulegacygold.com. This news release contains forward-looking statements, which relate to future events or future performance (including, but not limited to, the future exploration plans for, and the potential for heap leaching of gold mineralization from, the Red Hill Property) and reflect management’s current expectations and assumptions. Such forward-looking statements reflect management’s current beliefs and are based on assumptions made by and information currently available to the Company. Readers are cautioned that these forward-looking statements are neither promises nor guarantees, and are subject to risks and uncertainties that may cause future results to differ materially from those expected including, but not limited to, actual results of exploration activities, environmental risks, future prices of gold, operating risks, accidents, labor issues, delays in obtaining governmental approvals and permits, availability of financing and other risks in the mining industry. There are no known resources or reserves in the Red Hill Property and the proposed exploration programs are exploratory searches for commercial bodies of ore. In addition, the presence of gold resources on properties adjacent or near the Red Hill Property (including, but not limited to, Barrick’s Goldrush property) is not necessarily indicative of the gold mineralization on the Red Hill Property. All the forward-looking statements made in this news release are qualified by these cautionary statements and those in our continuous disclosure filings available on SEDAR at www.sedar.com. These forward-looking statements are made as of the date hereof and the Company does not assume any obligation to update or revise them to reflect new events or circumstances save as required under applicable securities legislation. 2 Gold mineralization at Goldrush is not necessarily indicative of mineralization at Red Hill.